Hughes: No one has yet turned up an original chart (among the many things that someday someone may find in the many English archives still untouched by Oxfordian research). We have his date of birth, April 12, 1550 (Old Style), April 22, 1550 (New Style), in an official document that there’s no reason to question. We don’t know his birthtime, but I do have a rectified chart that satisfies––me (at least)––that puts it around 10 AM. He was probably born in Castle Hedingham, but Sible Hedingham is close enough. 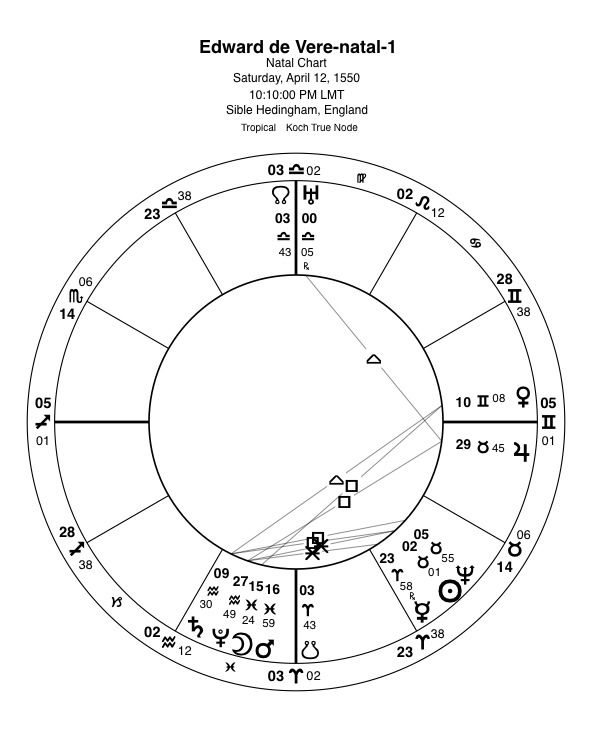 One of the most striking things about Oxford’s chart is the Moon conjunct Mars in Pisces. No matter what the time of day he was born, this tells us that the date has got to be correct, for it so perfectly reflects the way Shakespeare was able to portray intense emotion of all kinds. He could portray it because he was simply unable to restrain it. In this he’s very different from either Sidney or Bacon, his closest contemporaries, who could write about feelings, but not, like Shakespeare, in such a way that it seems as though the emotion itself is doing the writing (Donne comes closest to him in this ability). Oxford himself might have felt anxious about his horoscope, which so many then believed to be an immutable pattern that a life was bound to follow, because (if my rectification is accurate) the factors that show his genius were unknown in his own time. Without them, it could certainly have been seen as a weak chart. Also, with all his planets but Venus below the horizon, and that only degrees above it, it would have been seen as the chart of someone obscure, unknown for anything beyond his own family circle. This is utterly reversed by the addition of the planets discovered in modern times, for with Uranus conjunct the North Node of the Moon, and Neptune conjunct the Sun, we see artistic genius (most particularly, again if my rectification is correct, with the Uranus/node at the midheaven, and Sun/Neptune in the 5th house. That Uranus and Neptune form the sacrificial inconjunct shows what it cost him. It’s true that we can connect Oxford with John Dee, but that’s not where Oxford learned astrology. Eight of his most formative years were spent with one of England’s leading astrologers, his tutor, Sir Thomas Smith, whose interest in the subject comes through in letters, in notes in his diary, and most clearly in the titles in his library where Smith had the most arcane collection of books on astrology that it was possible to have at that time. [You’ll be better able to isolate the astrology books from John Strype’s biography of Smith (online) where they’re listed under Mathematics page 279.] No doubt Dee outdid him, but if so, only in quantity, not in quality. Dee and Smith would have been well acquainted, for both attended Cambridge during the same period and during the years that de Vere lived with Smith, the two astrologers lived only a few miles from each other on the Thames. Thank you for your reply! I am new to this site hence do not know who “you” are, but I am very pleased to see that you know astrology. As shown by de Vere in his knowledge of the Law, such knowledge cannot be faked; in the simple statements you make off-hand, as it were, I know how much you know! Then of course there is the question of your rectified chart – only another fellow astrologer would have done that. I’ll take a look at it and get back to you. I initially had calculated the chart in Gregorian, but last night figured out that it should have been in Julian, hence, as you point out quite rightly, 1+ deg. Taurus Sun and not, as I had had it, the middle of Aries!! And yes, the addition of the trans-Saturnian planets put a very different cast to the chart! (pun intended). In 1583 John Dee looked into the calculations of the Pope’s Calendar. He found a mistake. The maths was out by 1 day. Dee’s calculations were adopted by England finally in 1752 as the Amended Gregorian Calendar. With Dee’s corrections a person celebrating his birthday on April 12 would be more correct in celebrating them on April 23. See G.J.Whitrow, “Time in History” (Oxford University Press, 1988)pp.118-119. Curiously enough, the antiquarian, James West, responsible for instituting Shakespeare’s birthday on April 23 according to Schoenbaum (Shakespeare’s Lives) lived through England’s acceptance of Dee’s corrected calendar in 1752. Astrologers have known about this and compensated for it and numerous other adjustments in celestial mechanics. There will always be minor mathematical adjustments that need to be made, but we can rely on today’s technology to get the major times right. A site I found during my research on the Gregorian vs. Julian calendars (can’t remember which now) plainly stated that 10 days was the operative adjustment for the 16th Century, so I go with that. Dee might have been right but he wasn’t “sanctioned”. It is, however, quite fascinating/ironic, that if Dee was followed, the sublime Oxford would have been born on the date traditionally used for the birthday of “that man from Stratford” (though not the same year)! I love that horoscope! It seems quite accurate. Anyway, speaking of new-agey subjects, have any of you read ‘The Disappearance of the Universe’ (2004, by Gary Renard)? It’s pretty wild, and definitely a very niche read (it’s a conversation with two in-person “ascended masters”), but it does promulgate Oxfordianism. Here’s the section, if you can see it (two pages): https://books.google.com/books?id=-TTKOONVJrYC&pg=PA494 . In his next book Renard (or rather the ascended masters) correct the word “royalty” there to “nobility”, which Renard apparently misremembered when scribing the conversations after the fact.